Managing Heat Sensitivity Due to Multiple Sclerosis (MS) - All Care Hawaii. LLC. There was a time when doctors tested for multiple sclerosis (MS) by placing the patient into a hot bath to see if their neurological symptoms worsened due to the heat. This is because nerves that are already damaged by the disease have even greater difficulty conducting messages. For family caregivers and senior care providers of people with MS, understanding how heat affects MS symptoms and what to do about it can mean better overall management of the disease. Why Does Heat Affect Symptoms? Messages that control how the body works are passed along from the brain and spinal cord by electrical impulses that travel through nerves. MS damages the myelin that serves as a protective layer for nerves, which compromises their ability to conduct messages. The damage to the myelin makes the nerves even more sensitive to the effects of heat and further reduces the ability of the nerves to carry messages, sometimes stopping the messages altogether. Fortunately, heat only temporarily affects MS symptoms. Once the body cools down, the symptoms go away or at least go back to the severity they were at prior to exposure to heat. However, the person may feel very tired for a few hours afterward. Some people experience fatigue for up to a few days following an episode of overheating. Can a Person with MS Still Exercise? Exercise raises body temperature, which may make you wonder if your parent should participate in exercise since it could make symptoms worse. The answer is, yes, a person with MS can and should still exercise—they may just have to alter how or when they do so. Your parent should avoid exercising when it is very hot. Exercising in a place that is air conditioned will prevent overheating. The Multiple Sclerosis Association of America recommends aquatic exercise because of the cooling properties of water. They recommend that a pool used for exercise be kept between 80 – 86 degrees Fahrenheit. If there is an aquatic exercise program in your area, it may be a good idea to call the organization and find out what temperature they keep the pool at before signing your parent up for classes. How Can Senior Care Providers Help Reduce Heat-Related Problems? There are many things that family caregivers and senior care providers can do to help your parent avoid becoming overheated. -Stay where there is air conditioning when the weather is very hot or humid. -Drink cold beverages, like ice water. -Take a cool bath or shower. -Use fans and keep a hand-held fan nearby, perhaps even carrying one in a bag when your parent goes on outings. -Stay out of the kitchen when it is hot due to cooking or baking. -Wear clothes that fit loosely and are light-colored. -Stay in the shade when outside. -Try using specially made cooling clothes. Avoiding heat-related, worsening of symptoms requires some advanced planning, but it can make a difference in your parent’s quality of life. 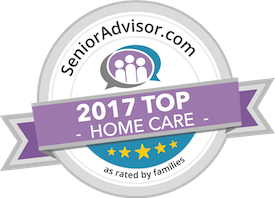 Hiring a senior care provider through an agency can be especially beneficial to your parent in the summer months since they can monitor your parent’s symptoms and assist them with staying cool on hot days. Have questions about homecare in Honolulu, HI? Contact the caring staff at All Care Hawaii today. Call us 24 hours a day, 7 days a week!